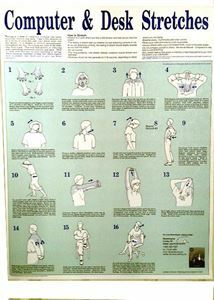 Computer and Desk Stretches in a 17" x 22" laminated 3-color poster. Perfect for display in the office! Posters cannot be shipped USPS Priority Flat Rate Envelope for $7.35; please choose only UPS or USPS Priority package shipping options (or USPS First Class Mail if ordering one paper Computer & Desk Stretches poster).